Knight of Swords, Five of Cups, The Moon from the Rider-Waite Smith Tarot deck, created by A E Waite and illustrated by Pamela Colman Smith. Click on the image for a larger version. There is no coincidence that this is the second appearance of The Moon in the triple eclipse period that has taken place over the last four weeks. The first eclipse was a lunar eclipse on April 25/26; the second a solar eclipse on May 9/10; the third a lunar eclipse that took place May 24/25 — in other words this weekend. If we can let go of our fear … and accept a period where not everything is clear, where it is best to travel light and remain flexible, where details are obscured, and where there is an ‘edge’ to our experience that is jagged and chaotic, then what these three creatures [jackal, dog and crustacean] bring to us is contact with something that has a particular kind of wisdom. Thus the Moon becomes a gift — the potential for something to become manifest. This is not about going back to what is lost. This is the acknowledgement of the extent of a loss and discerning whether your tracks are leading you somewhere new and in line with your unmanifest potential — or if they are simply leading you away from your feelings about the loss, or about loss itself in its many forms. What does loss mean to you? Where do you stand in relation to loss? 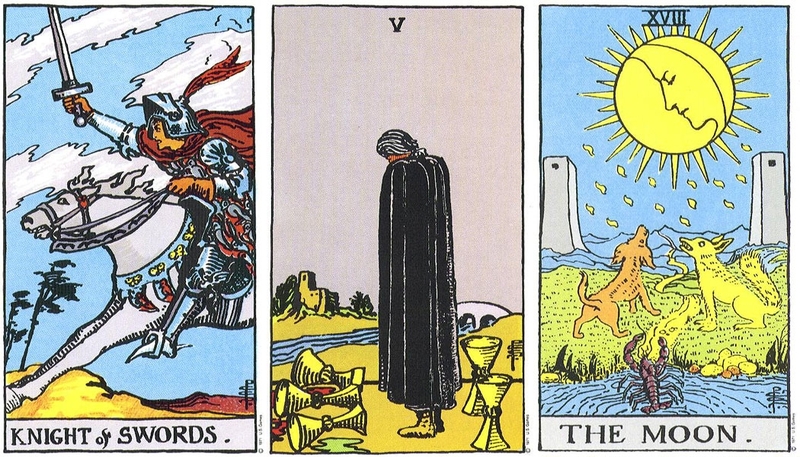 The three cups in the Five of Cups have spilled what needed to be spilled: the fact that we enter the world of the Five when the cups have already been upended suggests that this is a fait accompli. There is something to acknowledge and mourn, but there is also the clear suggestion of another aspect of the card that might lie out of awareness: the two cups that remain behind the mourning figure. They are the Two of Cups in another form. The Two of Cups offers the opportunity to experience oneself as love in the presence of another. It is the first card after the Ace, which is love as an archetype, i.e. the pure, untapped potential of its suit that is available to be drawn down into the physical world. Next to the Ace, the Two of Cups is the dualistic notion of love, where we contact it through something or someone external to us. 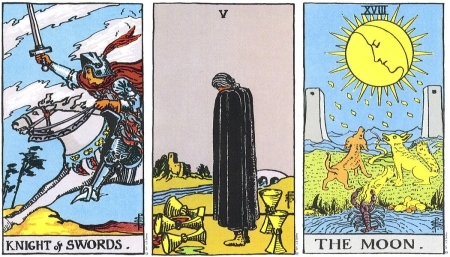 The cards may describe a situation in the outside world, but it is its reflection of the inner journey that is more significant, because that is the point at which all outer experiences start. Seen in this light, look at the cards in terms of an inner flight from loss. When the cups were spilled, did you see the whole picture of what was going on in your heart? Did you see what remained, as yet unexplored? Did you see what was available to you where you were? If there is a focus on loss alone, and a need to move away from painful circumstances, then there is the risk that any decisions stemming from it will be reactive rather than proactive: you run from, rather than to, a place in yourself that is open to receiving an invaluable source of love and support. What if you were to acknowledge the presence of love, to pick it up, and to take it with you? You might head in the same direction; you might go somewhere different. The difference is that you would be taking all of you with you — the pain, the loss, the grief, the shadow, the fear, and also the connectedness to a depth of you that you would never have explored otherwise. As you are willing to look into the night, to release yourself to your fears, you also release yourself to the parts of you that you held back along with your fears. Your intuition — asking you to turn around and acknowledge the gift in the loss, leading you back into relationship with yourself, and so others — is then seen as an ally rather than a chaotic landscape that howls with more than the mind can contain. Don’t enter it with your mind; enter it with your heart. You have no idea where it could take you. Many of us seek that which we will flee if we find it. I have seen this time and again, both in myself and in others. We seek, we search, and then we find a calling or a relationship that is a perfect reflection of our yearning… we turn away and go back to seeking, almost as though the light of our true-path was too bright for us, too vulnerable for us, too real for us. This is a pattern that we have to recognize and heal or else we will never stop looking for what is already there. True-path is not always around the next corner. Sometimes its right under our feet.